by Bill Dwight on Tuesday, September 14, 2010 at 10:34 AM | LEAVE A COMMENT! Lately, I’ve been looking around for the most convenient way to periodically take my kid’s virtual long term savings account balances in FamZoo and roll them over to real world savings accounts. 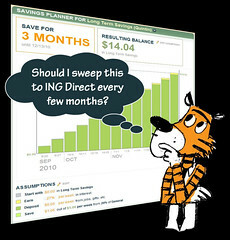 Jennifer’s article might just point to the solution I’ve been looking for: Orange Savings Accounts at ING Direct. The particular points of interest for me are: opening an account looks really easy, you can create any number of "sub-accounts" under a single login, no fees, no minimums, and attractive interest rates (relatively speaking). I’m going to give this a try in the next couple of weeks, and I’ll let you know how it goes. Len’s article lists the key traits that separate the "financially free" from the "financially inept". OK, as an engineer, I’ll admit that I was naturally drawn to the first trait: being detail oriented. My own nerdy biases aside, I still think it’s an excellent list. Where do you stand on these traits? Are you modeling these traits to your kids? Do you discuss them explicitly? Good food for thought. Laura is a top contributor over at the Bogleheads forum: an online community dedicated to “the civil discussion of investing, personal finance, and consumer issues.” She shares her six favorite suggestions for teaching kids critical financial skills — including taking “taxes” out of your kid’s allowances. We haven’t imposed allowance taxes in our family to date, but it sounds like a reasonable idea as long as you take the tax money and spend it on something enjoyed by the whole family as described in last week’s DadCents video post. How many of Laura’s suggestions have you implemented with your kids?